LIBS is a very efficient tool for pigment analysis since it is a rapid, noncontact and nearly non-destructive technique. This work focussed on the particular context of wall paintings analysis. Six common pigments were studied: ultramarine blue, red lead, green earth, charcoal, red and yellow ochre. Two complementary approaches were tested: macro- and micro-LIBS. Micro-LIBS enabled us to verify pigment distribution on a small area, thanks to its excellent spatial resolution and analytical capabilities. For macro-LIBS, the influence of laser energy and focal length on the crater size, induced by laser-material interaction and on plasma emission signal, were studied to evaluate their importance on sample alteration and pigment detection. It appeared that varying the focal length induced modification on the crater size without change in signal. Moreover, all pigments showed similar behaviour in terms of analytical signal. Laser energy and focal length also induced variations on crater diameters, suggesting a beam treatment to get a better control on crater dimension. 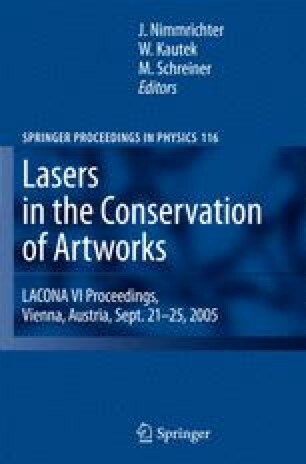 Raman microscopy was used as a diagnosis tool to check the preservation of the pictorial layer after a LIBS analysis.